If you’re a long-term fan of Back to the Future II, you’ll still be waiting to wear a pair of self-lacing Nike trainers. But while these smart shoes may not be part of your wardrobe (just yet) there are a whole host of smart textiles and clothes from buzzing yoga pants to intelligent sports socks that can be – and a bunch of futuristic fashion coming soon too. We’ve rounded up our favourites and the future technology that will change the way you dress forever. Many of us have planned on greeting the day with a spot of yoga so we’re zen in time for work. But becoming bendier than a pretzel isn’t easy, and it’s hard to know how to get into the right positions and how long to hold them for (if you can). Fitness clothing with built-in haptic feedback or vibrations could help. The Nadi X yoga pants from Wareable X have accelerometers and vibrating motors woven into the fabric around the hips, knees and ankles that gently vibrate to give you instruction on how to move. When paired with the Nadi X mobile app, visual and audio cues break down yoga poses step-by-step with corresponding vibrations directly from the pants. Data is collected and analysed and the app can track your goals, performance and progression much like an instructor might do. While it’s early days for haptic feedback sportwear, which is on the pricey side, we may one day have gym kit that could instruct us in everything from rugby to ballet, using gentle pulses. If you’ve ever turned up at an event only to find you’ve slightly misjudged the dress code, you might be glad of technology that helps you blend into your surroundings like a chameleon. Colour-changing clothes are on their way – and we don’t mean those dodgy Hypercolor t-shirts from the 1990s. Designers have experimented with embedding LEDs and e-Ink screens in clothing and accessories with varying levels of success. For instance, a company named ShiftWear attracted a lot of attention with its concept trainers that could change pattern thanks to an embedded e-Ink screen and accompanying app. But they never took off. Now, the College of Optics & Photonics at the University of Central Florida has announced the first user-controlled colour-changing fabric, which enables the wearer to change its colour using their smartphone. Each thread woven into Chromorphous’ fabric incorporates within it a thin metal micro-wire. An electric current flows through the micro-wires, slightly raising the thread’s temperature. Special pigments embedded in the thread then respond to this change of temperature by changing its colour. Users can control both when the colour change happens and what pattern will appear on the fabric using an app. For example, a solid purple tote bag now has the ability to gradually add blue stripes when you press a “stripe” button on your smartphone or computer. This means we may own fewer clothes in the future but have more colour combinations than ever before. The university says the technology is scaleable at mass production levels and could be used for clothes, accessories and even home furnishings, but it may be a while before we get our hands on it. You may have embraced wearing a fitness watch to collect data about your resting heartrate, fitness and sleep habits, but the same technology can also be built into clothes. 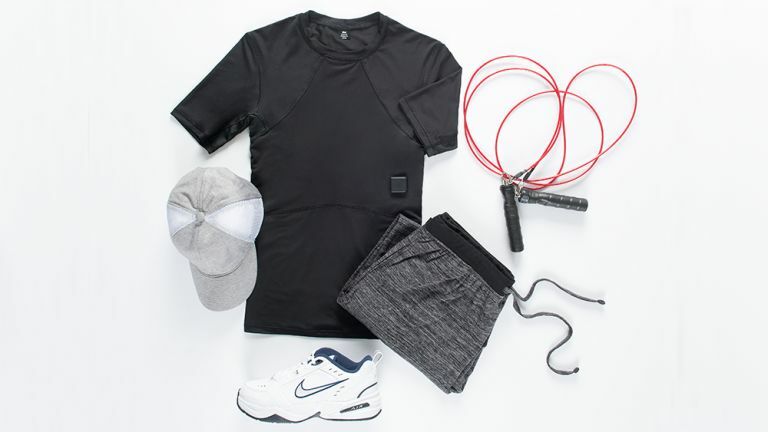 Omsignal has created activewear, workwear and sleepwear that collects a raft of medical-grade data without wearers noticing. Its bras, t-shirts and shirts are made using smart stretchy fabric with built-in strategically placed ECG, respiration and physical activity sensors. The data collected by these sensors is sent to a recording module in the clothing, which then sends it to the Cloud. It can be accessed, analysed and viewed using an app to help people work out ways of staying calmer under pressure at work, or how to sleep more soundly. The recording module can collect data for 50 hours without the need to be recharged and is splash and sweat-resistant. If you’re forever rummaging in your pocket or bag to see if you’ve got a text, this jacket might help. Levi’s Commuter Trucker Jacket is the first garment with Jacquard by Google woven in. Tiny electronics contained in a flexible snap tag connect the Jacquard Threads in the jacket’s cuff to your phone. The snap tag on the inner cuff lets a user know about incoming information, such as a phone call, by flashing a light on the tag and by using haptic feedback to make it vibrate. The tag also houses the battery, which can last up to two weeks between USB charges. Users can tap the tag to perform certain functions, brush their cuff to drop a pin to mark a favourite coffee shop and get haptic feedback when their Uber is arriving. It’s also possible to assign gestures in the accompanying app and change them easily. The jacket is tailored with the urban cyclist in mind, perhaps tapping into the hipster image, and features articulated shoulders to provide extra room to manoeuvre, reflectors, and a dropped hem for modesty. You might think that socks would escape getting a smart makeover, but Sensoria socks contain textile pressure sensors that pair with an anklet that magnetically snaps to the cuff of the sock and talks to a smartphone app. Together, they can count the number of steps you take, your speed, calories burned, altitude, walking distance as well as cadence and foot landing technique, which is brilliant for serious runners. The idea is that the smart socks could help to identify injury-prone running styles such as heel striking and ball striking. Then the app can put them right with audio cues that act like a running coach. The Sensoria ‘dashboard’ in the app can also help you achieve goals, improve performance and reduce risk of gravitating back to bad tendencies. While the way we dress often reveals a little about our personality, smart clothes can help you express yourself and make a statement – literally. A company called CuteCircuit makes clothes and accessories that can display messages and tweets. Katy Perry, Kelly Osbourne and Nicole Sherzinger have worn its couture creations, with the Pussycat Doll being the first to don a Twitter dress displaying #tweetthedress messages from the social media site. The company also makes t-shirts for us mere mortals and has now launched its Mirror Handbag. It says the accessory is precision machined out of aerospace aluminium and then anodised black and lined in a luxurious suede-touch fabric. But most importantly, the sides of the handbag are made of laser-etched acrylic mirror that enables the light from the white LEDs to shine through to create amazing animations and display messages and tweets. You can choose what is displayed on your bag by using the accompanying Q App, so you could tweet #blownthebudget, as the bag costs £1,500. Clothes of the future are tipped to integrate electronics such as phones so we can listen to music, get directions and take calls by touching a button or brushing a sleeve. But imagine how annoying it would be if you had to charge your jumper every day. To solve this problem before it becomes an issue, Georgia Tech researchers created energy-harvesting yarns that can be woven into washable textiles. They work by taking advantage of static electricity that builds up between two different materials thanks to friction. Sewn into socks, jumpers and other clothes, the fabric can harvest enough energy from the motion of waving your arms to power a sensor that could one day charge your phone. Last year Samsung patented a 'wearable electronic device and operating method’. The idea involves an energy harvester built into the back of a smart shirt that uses movement to make electricity, as well as a processor unit on the front. The patent says: “The present invention provides a wearable electronic device that activates a sensor using electrical energy generated by an energy harvester and determines a user’s activity based on sensor data obtained from the sensor." So it's a possibility that the harvested energy powers a sensor that could vibrate to provide haptic feedback or monitor a wearer's heartbeat. But of course there’s a rub…so far these technologies have only been tested in a lab and it may take some time before we see them in the clothes in our wardrobes. Most of our clothes have a negative effect on the environment, especially those made from non-biodegradable fabrics. But Adidas is doing its bit to make greener trainers. The UltraBOOST Parley trainer has a PrimeKnit upper that’s 85% ocean plastic and is made from 11 plastic bottles plucked from beaches. While the eco-friendly trainer isn’t brand new, the design has a sleeker silhouette and has just been released in a ‘Deep Ocean Blue’ colourway that Adidas said is inspired by the Mariana Trench, the deepest part of the world's oceans and the site of the deepest-known piece of plastic pollution: a single-use plastic bag. Adidas also uses recycled plastic for swimsuits and other products in its range with environmental organisation Parley for the oceans. Consumers seem keen to get their hands on the recycled material trainers, with more than one million pairs sold last year. With eight million metric tons of plastic waste washed into the oceans each year, there’s a lot of scope for other companies to use waste plastic in their clothes, too, meaning more of our garments could be made from recycled materials in future. If you do the laundry for your family, self-cleaning clothes are probably at the top of your futuristic fashion wish list. And it may not be too long before this dream becomes a reality (kind-of). Scientists claim tiny metal structures attached to cotton fibres can break down grime when exposed to sunlight. Researchers grew 3D copper and silver nanostructures on cotton thread, which was then woven into a piece of fabric. When it was exposed to light, the nanostructures absorbed the energy, making the electronics in the metal atoms excited. This made grime on the surface of the fabric break down, cleaning itself in around six minutes. Good news... but will they tackle tomato ketchup and grass stains? Only time will tell.